Your business plan is the document that summarises the operational and financial objectives of your organisation, and contains the detailed action plans and budgets showing how your objectives are to be realised. Properly constructed, the Plan will provide of all the goals, strategies and actions that you require to ensure your organisation’s survival and growth. 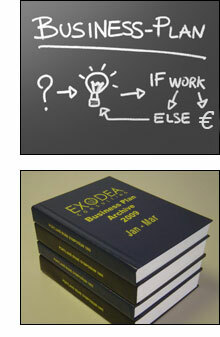 Exodea Europe embodies decades of experience of devising, writing and evaluation Business Plans at all levels. We can work with your organisation to create a road map that provides the directions so that you can plan your future, and help you to avoid bumps in the road. Experience shows that the time you spend making your business plan thorough and accurate, and keeping it up-to-date, will be an investment that pays big dividends for you in the long term. Typically, the Business Plans we undertake for our clients contain elements and processes drawn from all of the specialisations that we have noted above. The Business Plans that we prepare for for-profit organisations typically focus on financial goals, such as profit or creation of wealth. The Plans we produce with non-profit and government agencies tend to focus on the achievement of the organisational mission. All organisations, whether big or small, should devote time and resources to strategic planning since it is the process of determining long-term goals, and then identifying the best approach for achieving those goals. Using a variety of tested tools, Exodea Europe can work with you to devise and implement systematic processes of identifying a future position for your organisation, and translating this vision into broadly defined goals or objectives and a sequence of steps to achieve them. In contrast to long-term planning, strategic planning begins with your desired-end point, and works backward to the current status. At every stage of strategic-planning we will work with you to answer the question: ‘What must be done at the previous stage to reach here?’ In doing this, we will help you to look at the bigger picture so that the true potential of your organisation can be reached. It follows that in order to know where you are going, your organisation needs to know exactly where it stands. From that position you can determine where you wants to go, and how you will get there. In undertaking strategic planning exercises, we will work with your organisation to define your direction, and recommend how you can best allocate resources to pursue this strategy, including your capital and people. To achieve this we are competent at using a range of business analysis techniques, including SWOT analysis (Strengths, Weaknesses, Opportunities, and Threats), PEST analysis (Political, Economic, Social, and Technological), and STEER analysis. Surviving the current turbulent business environment demands flexible strategic planning. Exodea Europe has the expertise to work with you to produce an innovative and appropriate strategic plan that will enable your organisation to excel.